When the billionaire owner of the Minnesota Vikings football team decided last year he wanted a new, $1 billion stadium, he did what sports franchise owners often do: threaten to relocate to another state—at least implicitly—and thereby wrung nearly $500 million dollars from taxpayers. In May the Democratic governor, Mark Dayton, had to scramble to shore up large funding shortages for the stadium, proposing new taxes to rescue the wildly profitable sports team. That negotiation tactic is hardly uncommon in the sports world. But this year, a different kind of local juggernaut threatened to take its business elsewhere unless Minnesotans helped pay for a multibillion-dollar new development: The Rochester-based Mayo Clinic, one of the world's premiere destination medical centers, wanted to double its already massive campus, and its president and CEO, Dr. John Noseworthy, said in an April interview that "there are 49 states that would like us to invest in them." Worried that Obamacare will hurt its bottom line, Mayo is betting its future on its ability to lure an greater percentage of the wealthiest and sickest patients to its dazzling high-tech hospitals. The goal is to become not "one of," but the premier destination medical center of them all—the first choice for even the most winter-phobic of the global rich and sick. This race for supremacy includes not only American centers like the Cleveland Clinic, Houston's MD Anderson Cancer Center, and Baltimore's Johns Hopkins, but also ultra-toney destination hospitals sprouting in medical-tourist hotspots abroad, like Bangkok and Singapore. (Mayo’s patients come from all fifty states and about 150 countries.) A windfall awaits the winner: Worldwide, the market for medical destination is in the $60 billion range and growing at a 35 percent clip, according to a 2009 Deloitte & Touche report. The main entrance of the Gonda Building. 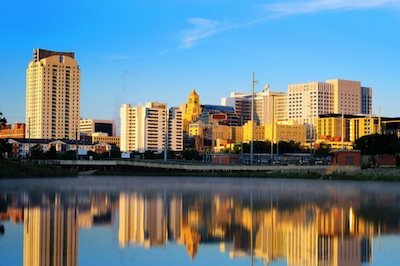 In order to accomplish this, though, Mayo has decided that Rochester, population 108,000, needs to double in size, too—that a small Midwestern city surrounded by endless cornfields must transform itself into one of America’s most dynamic, overachieving medium-sized cities: a Boulder, Colorado, or Madison, Wisconsin, but overrun with doctors instead of outdoorsmen. “The Mayo Clinic as an entity is a five-star experience. We want Rochester to be able to offer the same. We need more options,” Bradly Narr, Mayo’s head of anesthesiology and director of the Mayo’s new destination medical center division, said. There is little doubt that expansion will be good for Mayo. But what about Rochester? Will Mayo’s plan create a better, more desirable city to live in? Or is Mayo merely engineering a city in its own right-brain image, a science city lacking verve, an artistic firmament, and a quirky small-city soul? These questions don't seem to be on Rochester residents' minds. There was little opposition from the very taxpayers being asked to foot the $585 million bill for the new sewers, sidewalks, and roads required to accommodate the bigger, supposedly better, Mayo. Perhaps that's because proponents made convincing arguments about the economic impact of more deep-pocketed patients roaming the streets—or perhaps because a third of the city is employed by Mayo. Few are asking whether a one-company town like Rochester has a prayer of becoming, as Mayo hopes, the next Boulder—whether a hospital, no matter how large and famous, can attract the kind of vibrant, dynamic population that makes cities like Boulder the gold standard for medium-sized cities. And even fewer are questioning whether Rochester should want to be the next Boulder. From a lot of angles, mid-May in Rochester looked pretty close to a Norman Rockwell painting—Little League games in city parks, the local Pannekoeken restaurant chain dishing out Dutch apple pancakes. Also, the Dalai Lama was in town for a check up, the golfer Tom Watson was reportedly seen in a local coffee shop, and workers at the airport were talking about the unfathomably wealthy family behind Samsung swooping in from Seoul by private jet. Ailing celebrities and foreign tycoons are a regular part of the daily commotion. But Mayo’s expansion will bring commotion of a different kind, as it's one of the biggest urban development plans in the country. In other words, construction cranes—a lot of construction cranes—are coming, to expand what is already the largest private employer in Minnesota (including satellite operations in Florida and Arizona, Mayo claims to generate $22 billion in annual economic activity). 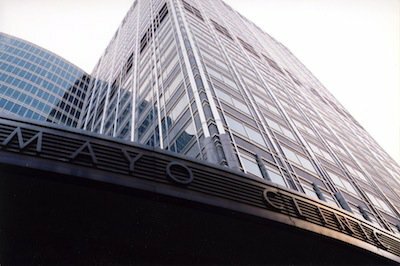 And because the decision to double in size was made entirely within Mayo’s executive offices, this private hospital, not city hall or the state, is in charge of transforming Minnesota’s third most populous city. This is the Mayo narrative: Obamacare won’t bring down Mayo’s costs but will bring in more patients whose Medicare coverage pays only 60 cents on every dollar Mayo spends on their care. Meanwhile, the regional insurance networks that people are supposed to join under the Affordable Care Act won’t agree to send Mayo its sickest customers, instead sending them to cheaper hospitals closer to home. And even if regional exchanges do stream insured patients to Mayo, hospital executives are unsure whether businesses will even sign up for them. “We’re staring at a dramatic change with the insurance exchanges. We don’t know what will happen in businesses—will they join the exchanges or take the fines?” said Narr, the director of the Mayo’s destination medical business. Mayo isn’t on the verge of collapse by any means. But as with competitors like Johns Hopkins, it invests heavily on research and maintains expensive specialties in rare conditions. Which is what makes expanding the destination medical business so crucial, Mayo officials say. If Mayo can’t count on heavily insured patients from the region as a chunk of its billings, the clinic will need even more wealthy patients to help fund its investments in, say, robotic surgery or to subsidize its $360 million outlay to build facilities for two heavy proton beam accelerators used against cancers. Meanwhile, maintaining unique expertise in esoteric diseases requires seeing a lot of people suffering from them. Only a relentless stream of challenging patients from around the world can keep Mayo on the very tip of that healthcare triangle—and that can only happen, Mayo believes, with a surgical makeover of its home city. The goal is to reinvent Rochester as a vibrant city that can employ doctors’ trailing spouses, offer places for cultural expression, places to go on a weekend night—in short, a city that people would like to visit and relocate to. Taking a page from Richard Florida's book, Mayo plans to blanket the area with stylish condos, hip bars and restaurants, and an expanded satellite campus of the University of Minnesota. Everyone has a role: The city builds out the supporting infrastructure, private developers construct the steal-and-glass condos and office space, and Mayo lures the out-of-town corporations whose young professionals will populate all of these places, making the city thrive. 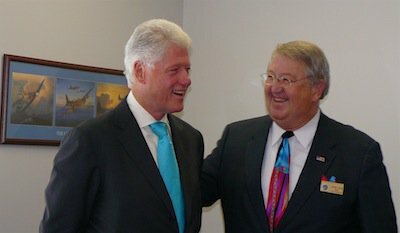 Rochester Mayor Ardell Brede with former President Bill Clinton. Mayo will submit five-year plans that the city council then decides whether to approve. But in filling a municipal board created by state legislation with the authority to levy taxes and issue bonds for the expansion, “in some scenarios no elected officials were on it. Mayo would have the decisions on bonded authorities and taxes,” said Rochester’s avuncular mayor, Ardell Brede, a former Mayo employee, in his tchotchke-filled city hall office. The board composition has since been changed to have elected officials on it, but Brede says he was also taken by surprise when Mayo told him the city would need to cough up a significant amount of tax dollars to support Mayo’s destination medical center ambitions. He’s now considering a sales tax increase. It would be fair to ask whether Rochester has much to lose, whether it has an artistic firmament and quirky, small-city soul in the first place. You have to search for it, but it's there—in places like the Rochester Civic Theater, on the periphery of the downtown hive. Its director, Gregory Stavrou, a man in his mid-50s, with a goatee and a passing resemblance to Cat Stevens, moved to Rochester from Minneapolis five years ago to take charge of the theater. As I sat at a back table, a stream of people approached to tell me how much he has advanced the arts in Rochester. Earlier, the mayor had said much the same thing. Stavrou has brought immigrant groups, like Mexicans and Somalis, into the theater as performers and audience members, and created performance programs that encourage intra-demographic mingling—older and younger people, gay and straight—that doesn't often happen elsewhere in the city. 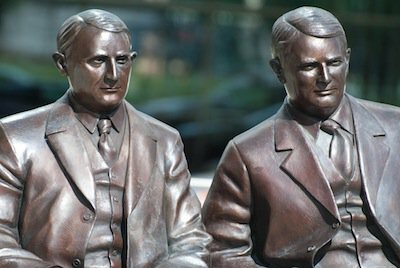 A statue of clinic co-founders Charles Horace Mayo (left) and William James Mayo (right). Stavrou tells me that Rochester will need to overcome its Midwestern insularity and more seriously fund the arts if it wants to look anything close to Boulder. “Rochester is genuinely very nice and open, but there’s a feeling here that certain neighborhoods are filled with ‘people from Chicago.’ That’s a bad thing by the way. Maybe they’re from Chicago. Maybe they’re from Mexico. Maybe they’re from Rochester. It’s a mentality that is going to have to go,” he said. In other words, it's going to take more than new buildings to create a new Rochester: A cultural shift needs to happen, one that no multibillion-dollar plan can engineer. But a little money in the right places would help, too. Stavrou told me that he appreciates the artistic talent of some of the Mayo employees who perform in community plays, though he’s less happy with the paltry $10,000 Mayo donates each year to the theater, a crimped donation he suspects echoes Mayo’s development priorities. The performance, held in the lobby, was a jumble of spoken-word, original music, unstructured dancing, and Avenue Q-style puppetry. The performers ranged in age from about 25 to 50; one worked at the local Chamber of Commerce, and performed alongside a geriatric wellness specialist, a bartender, and an employee of Mayo’s development office. The show was surreal and ridiculous, and afterward, the performers threw an after-party in the very same lobby. Stavrou popped bottles of wine from behind the theater concession stand, then sparked a cigarette in defiance of his own theater’s no-smoking signs. It was intimate, piquant and even slightly subversive—not at all the kind of gathering you’d commonly find in a city like, say, Boulder. Correction: A previous version of this post stated that the Mayo Clinic has 60,000 employees in Rochester. It has 34,000 employees there. The article also stated that the local archdiocese built a high school in Rochester; it was the Diocese of Winona.